Overview: At the COP21 conference in Paris, President Obama claimed wind and solar are “finally cheaper” than fossil-fueled electricity in “parts” of America. He offered no evidence for that boast. Central station solar generation is clearly not cheaper on a levelized cost basis. Wind is not cheaper either once transmission, intermittency, fossil-fuel backup, and “broken window” costs are taken into account. Addressing the First Session of the COP21 Paris climate conference today, President Obama took credit for helping create markets where wind and solar power “are finally cheaper” than coal and gas. Over the last seven years, we’ve made ambitious investments in clean energy, and ambitious reductions in our carbon emissions. We’ve multiplied wind power threefold, and solar power more than twentyfold, helping create parts of America where these clean power sources are finally cheaper than dirtier, conventional power. Implication: There’s no risk of harm in regulating the world beyond coal- and gas-fired electricity, because renewables are already cheaper in “parts of America,” and in time they’ll be cheaper in most markets — maybe everywhere. But is it even true for “parts” of America today? The President provides no specifics but presumably refers to Energy Information Administration (EIA) estimates of the levelized cost of electricity (LCOE) for different types of new generating units. The LCOE represents the inflation-adjusted per-unit (kilowatt-hour or megawatt-hour) cost of building and operating a generating plant over an assumed financial life and duty cycle. 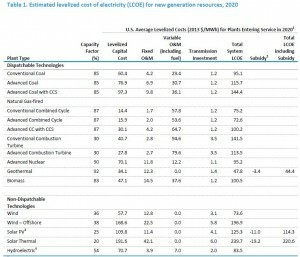 For new units starting service in 2020, EIA estimates that the LCOE for wind ($73/MWh) is cheaper than the LCOE for both coal ($95/MWh) and natural gas combined cycle ($75/MWh). Since load must be balanced on a continuous basis, units whose output can be varied to follow demand (dispatchable technologies) generally have more value to a system than less flexible units (non-dispatchable technologies), or those whose operation is tied to the availability of an intermittent resource. The LCOE values for dispatchable and nondispatchable technologies are listed separately in the tables, because caution should be used when comparing them to one another. Demand for electricity is often highest (hot summer days, cold winters) when wind power production is lowest. Economist Jonathan Lesser found that in three interconnection regions during 2009-2012, more than 84% of the installed wind generation infrastructure failed to produce electricity when electric demand was greatest. Wind generation can be as valuable as metro service that stops operating at rush hour. 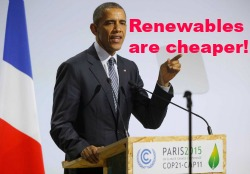 Obama says nothing about wind’s intermittency problem, nor about other hidden costs that falsify his boast. Extra transmission cost. The best sites for wind and solar power are sometimes at great distances from population and industrial centers. So delivering renewable power to consumers may require construction of extensive transmission infrastructure. Such infrastructure costs are not included in LCOE comparisons. Relative to the wholesale price of electricity, which hovered around $50 per MWh for most markets in 2014, the PTC represents an expensive direct subsidy of around 50 percent of the wholesale price of electricity. In terms of pre-tax value, the PTC is worth approximately $35 per MWh, often making the federal subsidy equally as valuable to the owner of wind facilities as the market price of electricity. Furthermore, since the PTC is not tied to the wholesale price of electricity, owners of wind facilities can afford to pay the electrical grid up to $35 per MWh to take their power and still make money. Inefficiency and fossil-energy backup cost. Subsidized wind can create electricity gluts that make unsubsidized coal, gas, and nuclear power unprofitable. Yet it is not only consumers who depend on those sources when the wind isn’t blowing. Wind also depends on coal and gas for backup power. Keeping coal and gas running in reserve mode as backup for wind is inefficient, increasing the cost of those power sources. Key point: The cost of inefficiently-run coal and gas units required to backstop wind is also not included in LCOE comparisons. Broken window cost. Finally, LCOE comparisons refer solely to new generation placed in service at some future date. Like the hooligan who enriches glaziers but makes his community poorer by breaking windows, subsidized wind can smash (displace) existing coal and gas power plants, which are significantly cheaper than new wind generation. In a June 2015 study, IER found that new wind generation costs about twice as much as existing gas generation and about three times as much as existing coal generation. 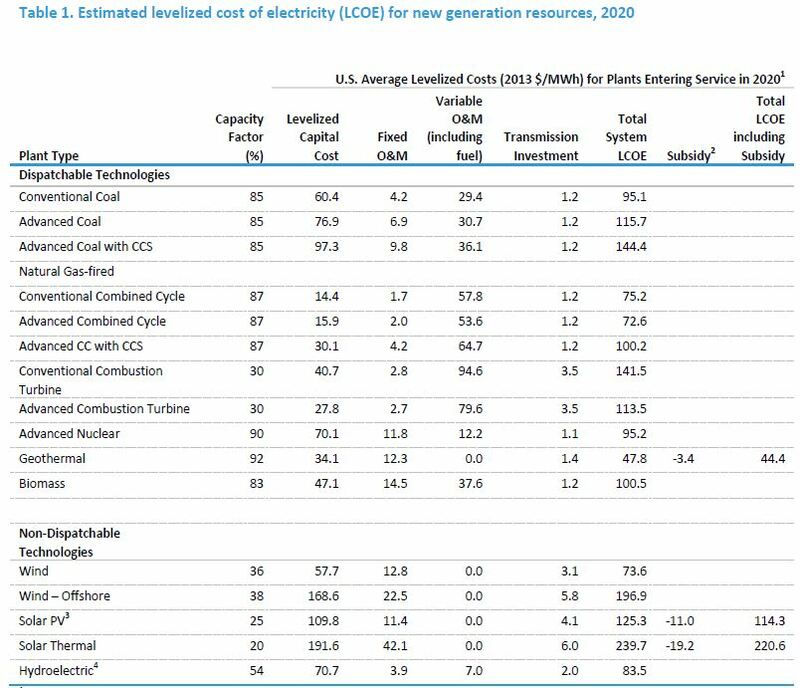 In sum, once the hidden costs of renewable energy are combined with LCOE information, it is doubtful that in “parts” of America, “these clean power sources are finally cheaper” than coal and gas. Even on a strictly LCOE basis, it’s hard to see how solar PV and solar thermal are finally cheaper. Most importantly, the so-called Clean Power Plan that is the core of the President’s emission-reduction pledge at the COP21 conference is primarily designed to replace existing coal with new renewables. As the IER June 2015 study shows, the LCOE of new wind is substantially greater than that of existing coal.